Our new version of The Gondoliers will take place in a Venetian art gallery! One by one, each group of Gilbert’s characters will burst forth from the gallery walls and into the ‘real world’. Take a dash of Hogwarts, add a whole lot of Night at the Museum, dust with a pinch of Ruddigore and you’ll get the idea. Above and beyond this conceit of design, this production will focus on the fire that exists between the sexes. As equally as The Gondoliers lampoons the issues of social station, it also richly and most evocatively deals with that most popular of topics – love. It is my constant aim to surprise audiences. That is, to show them something new, and, in the case of this Society, to help them fall in love with Gilbert & Sullivan – all over again, or, in many instances, for the first time. Firstly, since our Gondoliers will be set in the ‘Gilbert & Sullivan’ wing of a great Venetian art gallery, the ‘gallery walls’ of our set will be adorned with landscapes inspired by the G&S repertoire. Of course, these will be living paintings – filled with G&S chorus members! Secondly, the sensational cachucha sequence will be (with the assistance of Ian Andrew’s magical musical mind) interwoven with themes and musical sequences from each of the G&S comic operas – from Patience to Pinafore to Pirates! Of course, the entire chorus will become embroiled in the celebratory shenanigans! 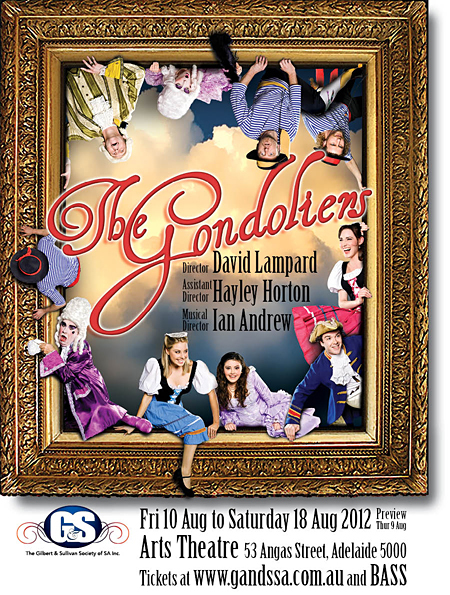 This production – like all good productions of The Gondoliers – will be fresh, fiery and fun!